4. Deutsche Bank, JP Morgan, UBS and Depfa Bank Plc were convicted by a Milan judge for their role in overseeing fraud by their bankers in the sale of derivatives to the city of Milan. 5. Welcome to Deutsche Bank Fraud Exposed. Fraudulent foreclosures (and evictions) are known to be rampant around the country. 8. 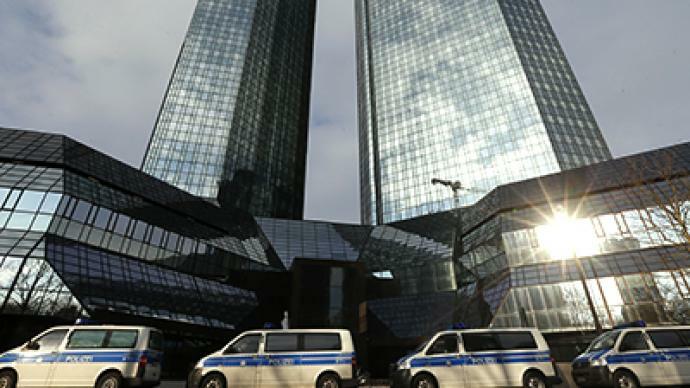 Whistleblowers alleges massive fraud at Deutsche Bank. “A trio of whistleblowers have come forward to allege that Deutsche Bank perpetrated a $12 billion fraud to hide the true extent of credit derivatives losses. Deutsch Bnak, which moved it’s Investment Banking Headquarters to London, is not a “German Bank,” since it entered into the British American financial world to make money. It’s just part of an international investment banking system headquartered in Anglo-Saxonia. Completely agree – but for one point. It is a German bank when it has to be bailed out. Not a German bank? Not often you see such stupidity, even on the internet. Reblogged this on Alien Penguin's Angry Feet. The assertion is that owners / managers employ a deliberate strategy of going broke (intentional looting) rather than subsidised risk taking / speculation. The reason for this occurring is that various conditions conspire to make this strategy yield a positive pay-off to the potential looter (high salary, over-inflated firm valuation, Gvt guarantees, low penalties for abuse etc.). Fraud is now endemic in the Anglo-Saxon banking model. 1} THE GREEK POLICY IS COMPLETELY CONTROLLED BY DEUTSCHE BANK THROUGH ITS PUPPETS samaras AND venizelos. The German government’s policy on debt restructuring for Greece is lifted directly from policy papers prepared by the Deutsche Bank, it has emerged. The proposal floated at the beginning of June by the German Finance Minister Wolfgang Schäuble for a voluntary bond swap leading to a prolongation of the outstanding Greek sovereign bonds by seven years is based on a document by Deutsche Bank, investigative reporters from Germany’s ARD TV station have revealed. The Deutsche Bank document called “Proposal for Greek liability management exercise – burden sharing without haircuts” insisted, not surprisingly, on a voluntary participation by banks. ” Recently Greece took the «honor» of first place in Europe for reducing budget expenditures on health services. In particular, expenditures on medications were reduced from 5.6 billion euros (2010) to 3.8 billion euros in 2011 and to 2.88 billion euros in 2012. As a direct result of this, over 50 world pharmaceutical companies have discontinued shipments of medications to Greece. It has become common for relatives of hospital patients to have to run exhausting marathons from pharmacy to pharmacy in search of needed medications. There is an acute shortage of medical equipment. State hospitals are short around 6,500 doctors and 20,000 nurses and orderlies; massive numbers of medical professionals are leaving the country. 3) GREECE IS ONE OF THE FEW STATES OF THE WORLD THAT KEEPS THE PRISON FOR DEBT AND THE UNIQUE IN EUROPE. 4) DEUTSCHE BANK BLACKMAILS AND CUTS THE ELECTRICITY IF GREEKS DO NOT PAY EXORBITANT TAXES ON THE PROPERTY. ” The president of Deaf Federation told reporters that the woman is not the only one in desperate situation because her social welfare allowances have been cut. Greece saw a sharp increase of suicides due to economic problems after the country sought the aid of the International Monetary Fund. THERE ARE ALSO LINKS AMONG EVELYN DE ROTHSCHILD AND DEUTSCHE BANK. VERNON JORDAN, THE BIG FRIEND OF EVELYN DE ROTHSCHILD AND LYNN DE ROTHSCHILD, HAS BEEN A DIRECTOR OF DEUTSCHE BANK. “A man with terminal brain cancer is among those being told they are ‘fit for work’ under the government’s work capability assessment programme, new research has discovered. ARIANE DE ROTHSCHILD ( https://en.wikipedia.org/wiki/Ariane_de_Rothschild ). It is good this thread has been resurrected to remind us of the reality behind the Greek situation. Good for Merijn’s collting the evidence in the first place.